RYOBI introduces the Hybrid Stereo with Bluetooth wireless technology. Hybrid functionality means it will never run out of power with the option of powering the stereo with an 18V ONE+ battery or an extension cord (both sold separately). Stream music wirelessly from a Bluetooth-enabled device or connect an audio player through its auxiliary port. AM and FM stations can also be tuned in via the digital display. A USB port allows you to charge smartphones, tablets, and other portable devices. Backed by the RYOBI 3-Year Manufacturer's Warranty, this Hybrid Stereo with Bluetooth wireless technology kit includes two AAA alkaline batteries, an aux-in cable, 18V battery, 18V charger and an operator's manual. The Makita DC18RD Lithium-Ion Rapid Charger charges 18V lithium-ion compact batteries in 15 minutes, 3.0Ah batteries in 22 minutes and 4.0Ah batteries in 36 minutes! Its Optimum Charging System incorporates three active controls (current, voltage and temperature) that provide an optimal charge and ensure batteries cannot be over-discharged or over-heated during the charging cycle. A Central Processing Unit (CPU) in the battery communicates with the charger to analyze battery and charge according to its unique condition. And, the Digital Power Display indicates the condition of battery and current charge level (-80%, +80%, 100%). The Ryobi 18V ONE+ Drill/Driver and Circ Kit provides superior Li-Ion performance to get the job done. The drill includes a 1/2-inch heavy-duty single sleeve and a keyless chuck with 24-position clutch to match your drilling and driving needs. A multipurpose carbide-tipped blade comes with the 5-1/2-Inch circular saw, capable of carving through thick material and sheet goods at speeds up to 4700 RPM (no-load). Includes 1 lithium-Ion battery and a charger that will power over 125 ONE+ tools. This is all covered under a 3-year manufacturer's warranty. Available while supplies last as a Special Buy, Ryobi's 18V ONE+ Li-Ion Impact Driver Kit drives long and large fasteners with ease and delivers 1500-inch lbs. of torque for the most demanding applications. Featuring a 1/4-inch quick-connect coupler for fast and easy bit changes, the tool includes cast aluminum gear housing to ensure strength and durability. The powerful Li-Ion battery provides 20% more run time and is 45% lighter weight than the P100 NiCd battery, providing provide fade-free power for maximum performance throughout the charge. Best of all, any ONE+ battery is compatible with any green or blue ONE+ tool, giving you maximum versatility for your collection. 18V ONE+ Hybrid Stereo Kit with Battery and Charger RYOBI introduces the Hybrid Stereo with Bluetooth wireless technology. Hybrid functionality means it will never run out of power with the option of powering the stereo with an 18V ONE+ battery or an extension cord (both sold separately). Stream music wirelessly from a Bluetooth-enabled device or connect an audio player through its auxiliary port. AM and FM stations can also be tuned in via the digital display. A USB port allows you to charge smartphones, tablets, and other portable devices. 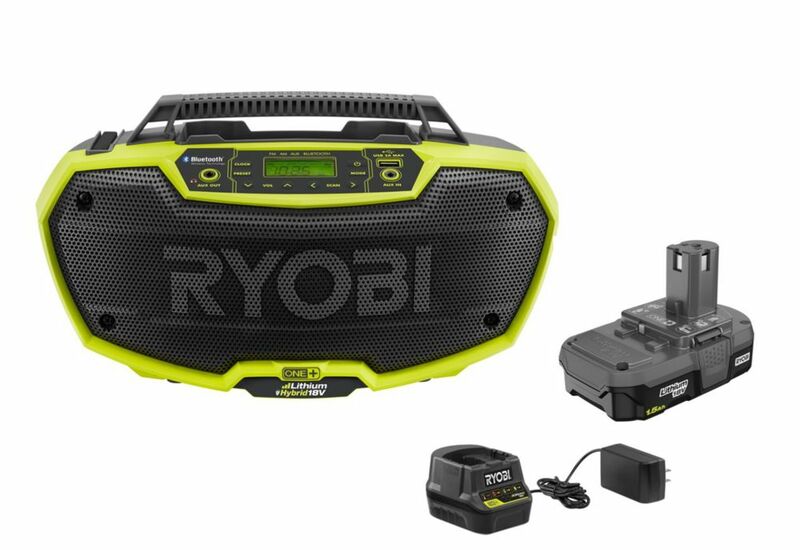 Backed by the RYOBI 3-Year Manufacturer's Warranty, this Hybrid Stereo with Bluetooth wireless technology kit includes two AAA alkaline batteries, an aux-in cable, 18V battery, 18V charger and an operator's manual.